Co-author and chef Joshua McFadden spent two years learning with farmers and writers Eliot Coleman and Barbara Damrosch in Maine. 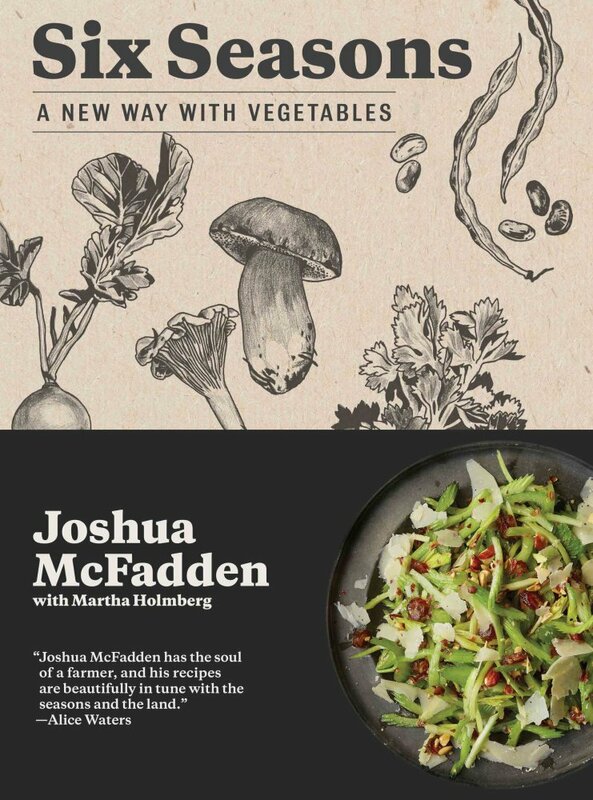 “Six Seasons: A New Way With Vegetables.” By Joshua McFadden with Martha Holmberg. Artisan. $35. When I picked up “Six Seasons: A New Way with Vegetables,” I mistakenly assumed it would be another take on fresh and healthy eating – I strongly suspected it might lean heavily to the “fresh-healthy” spectrum, even dip into vegan-adjacent. I couldn’t have been further off-point. “Six Seasons” focuses on vegetables, but it is not a vegetarian cookbook. In fact, one could argue aside from the fact that it features vegetables, many of the recipes – full of cheese, oil and fatty meat like sausage – aren’t even terribly good for you. But they are terribly good, and “Six Seasons” offers an exuberant, engaging approach to vegetables. Chef and author Joshua McFadden, who owns Ava Gene’s, a Roman-style restaurant in Portland, Oregon, cooked and learned at high-end kitchens in New York, Chicago and the San Francisco Bay area. And for two years he worked on Four Season Farm near Castine, the year-round farm owned by renowned gardeners Eliot Coleman and Barbara Damrosch. As its title suggests, seasonality is a key feature of McFadden’s book, which he wrote with Martha Holmberg, a former editor and publisher of Fine Cooking and former food editor at the Oregonian. The book is divided into seasons, with summer split in three – early, mid- and late. The intent is to highlight the vegetables available, give some general cooking pointers, and four or five recipes for each. 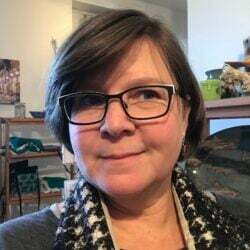 None of the vegetables in the book would be unfamiliar to a Maine backyard gardener, anyone who has visited a local farmers market or who gets a weekly CSA collection of vegetables. Eating through the seasons this way is really fun, and the book’s wealth of varied and inventive preparations is especially helpful right now, when Maine’s cornucopia of vegetable offerings is on full display. Unsure what to do with the pounds of zucchini overflowing your crisper? Try a squash and “tuna melt” casserole, McFadden’s take on the classic home-style dinner. Bored with steaming spring asparagus? Try it sautéed with garlic scapes, pea shoots, poached eggs and Pecorino cheese. “Six Seasons” also includes a handy guide to quick-pickling solutions that can stretch the bounty further and a short, but utilitarian, breakdown of sauces, dips and dressings like pine nut vinaigrette, spicy fish-sauce sauce and pickled vegetable mayonnaise. Though the recipes have no particular unifying theme, many are influenced by Italian cuisine. That holds true for Rigatoni with Broccoli and Sausage. It’s the kind of dish that shows off the parts of the book I liked the best. 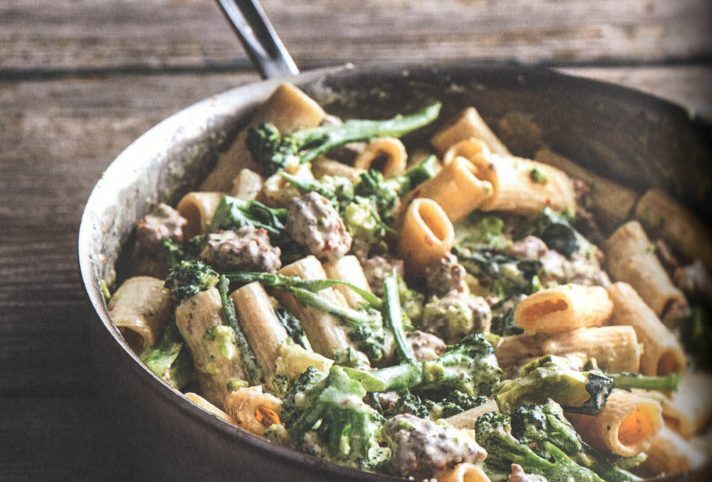 It’s a hearty, flavorful dish that doesn’t shy away from plenty of cheese and meaty sausage flavor, yet still manages to keep the broccoli front and center. It also includes a couple of clever cooking tricks – cooking sausage as patties, not crumbled, and adding broccoli directly to the cooking pasta. The book’s recipes are full of such little asides and tips that I plan to use in my own recipes. P.S. Don’t buy tomatoes in winter. Put the garlic in a small bowl and pour over enough olive oil to cover. Shape the sausage into 4 balls, then flatten them like hamburger patties. Bring a large pot of water to a boil and add salt until it tastes like the sea. Add the pasta and cook just shy of al dente, according to package directions. Add the broccoli coins and the sliced garlic, including the oil, to the skillet. Flip the sausage patties and keep cooking until the sausage is just about fully cooked (it’s OK if it’s a touch pink in the center, because it will continue to cook a bit), another 4 minutes or so. Break up the sausage with a spoon into bite-sized chunks. Add the chili flakes and cook for 30 seconds or so. With a ladle or a measuring cup, scoop out about 1/4 cup of the pasta cooking water, add it to the pan to stop the cooking of everything, and slide the pan from the heat. About 3 minutes before the pasta should be al dente, add the broccoli florets and cook all together, until the pasta is ready. Scoop out another cup of the pasta cooking water, drain the pasta and broccoli, and add to the skillet. Return skillet to the heat. Add 1/4 cup or so of the pasta water, the whipped ricotta, and half of the Parmigiana. Shake the pan to combine the ingredients, put back over medium heat, and cook for a couple of minutes to warm everything through and make a nice saucy consistency. Serve with more Parmiagiano and top with the breadcrumbs. Put the ricotta, salt and 20 twists of pepper in a food processor and start to process. With the motor running, add the olive oil in a thin stream. Pause and scrape down the sides if needed. The mixture should get lovely and creamy. Taste it and adjust with more salt, pepper or even a bit more olive oil – you should be able to taste the oil as well as the ricotta.